Whether you’re running a hotline or setting up a business phone number, you’ll need the ability to route incoming calls to multiple people to ensure that calls are being answered. With Telzio, you can forward calls to multiple agents and devices in any location. In this article we’ll outline how to forward calls to multiple phones in 3 steps. Telzio Call Flows are the easiest way to customize call forwarding and professional calling features for your business. We’ve taken sophisticated features and simplified them into a visual workflow editor so there’s no programming or technical expertise needed to implement them for any small business. Located within the Call Flow are a number of features that you can select from. 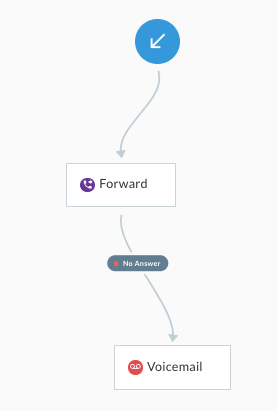 In this article, we’ll be working with the Forward feature. To open a new Call Flow, simply navigate to the Call Flows page from your Telzio Dashboard, and click Add Flow. 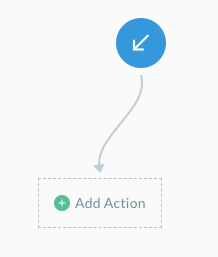 From there, you’ll see the beginning of a Call Flow, where you can start by adding the first feature, or “action” that you want to happen when a caller reaches your number. The blue arrow indicates an incoming call. Next we’ll add the first action, in this case – Forward Call. When you click to add the Forwarding action, you’ll get a window where you can enter the call forwarding details. The most important part of the Forwarding settings is the bottom section where you can add “Destinations”. Destinations can be another phone number or a Telzio User. You would choose User as the destination if you want to forward calls to an IP phone or the Telzio mobile app. Learn more about Telzio Users. Call Distribution – Call all the agents at once, or in order. Call Settings – Record calls and screen calls. Caller ID – Show the caller’s number or show your business number. Hold Music – Play hold music for callers while they wait. Hold Message Voice – Make an announcement while callers wait. You can find more information about Forwarding settings on our support pages. For the final step of the Call Flow you can add a Voicemail in the case that no one is available to answer the call. You can send Voicemails to an email, an individual User, or a group of your Users. In this article we’ve created a very simple Call Flow, which routes incoming calls to a group of people and then on to a voicemail if there’s no answer. 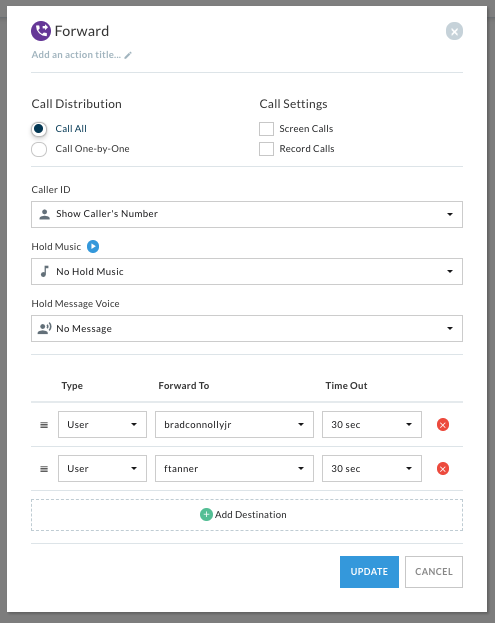 With features like Queues, Phone Menus, and Business Hours, you could design a Call Flow that looks much different!